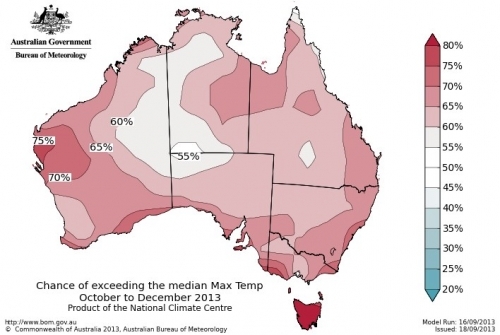 Winter may just be ending in Australia, but temperatures are already summerlike. September was one for the record books, with hot temperatures that baked the country from the outback to the coasts and made this the hottest September in the country’s 104 years of record-keeping. The warm start to Australia’s spring keeps the country on a path to having its warmest year on record. 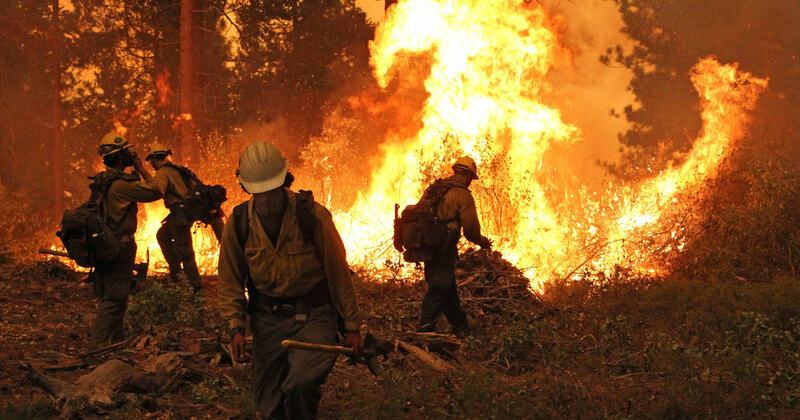 Following a wet winter, warmer-than-average conditions have also put parts of the country on watch for yet another intense wildfire season. Nationally, September temperatures averaged nearly 5°F above normal. That beat the previous hottest September, set in 1983, by a full 2°F. This September also happened to be the most anomalously warm month of record, narrowly edging April 2005 by 0.2°F. In other words, Australia has never had a month so freakishly above average. Parts of Australia experienced temperatures that were nearly 10°F above average this September, which was Australia's hottest on September record. The unusually warm weather wasn’t isolated to a specific part of the country. Of the eight states and territories in Australia, six experienced record-high average temperatures. However, the two regions where records weren’t set, Tasmania and Western Australia, weren’t far behind. This was Tasmania’s third warmest September and Western Australia’s fourth warmest. 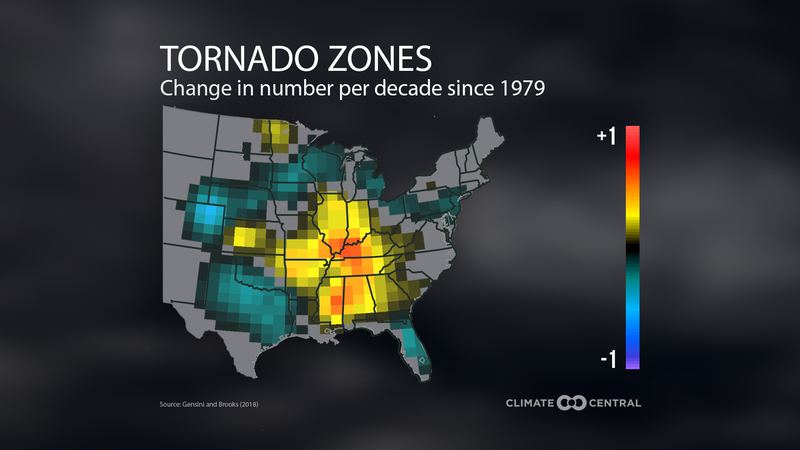 Though September was record-setting, August also had a notable ending. On August 31, the last day of winter, average temperatures reached 85.9°F. That’s the warmest last day of winter recorded in Australia. The warm weather is part of longer-term hot streak for the “Land Down Under.” Temperatures soared so high in January, during the continent's summer season, that the Australian Bureau of Meteorology famously had to add a new color to its temperature map to account for the unrelenting heat. The summer of 2013 ended up being Australia's hottest on record, and since January, monthly temperatures have stayed above normal. The average temperature for the year-to-date is 2.8°F above normal. If the year ended today, this would be Australia's hottest year-to-date, putting it ahead of 2005 by a full half a degree Fahrenheit. 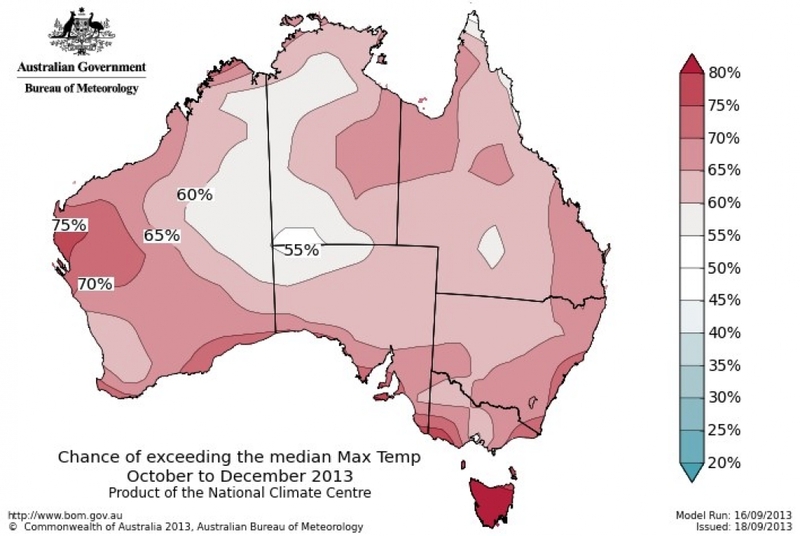 Warmer-than-average days are projected across much of Australia through the end of the year. That means Australia could be on pace to have its warmest year on record. But the year will roll on for three more months, and there’s little relief in site. Australia’s Bureau of Meteorology is forecasting warmer-than-average conditions through year's end for much of the country. A small part of Australia’s interior is forecast to have near normal temperatures, but that’s little consolation given that 85 percent of the country’s population lives within 31 miles of the coast. More ominous than the warm weather itself is what could come with it. According to the Bushfire Cooperative Research Center, areas along the east and west coasts of Australia are forecast to have an above-normal bushfire season after a wet winter helped build vegetation. The persistently warmer-than-average conditions this spring have helped dry those grasses and build fuel for fires. The Australian newspaper has already reported large wildfires near Sydney, where an iconic lighthouse was saved by firefighters last week. Earlier in the month, The Guardian also reported on an unusually quick start to the bushfire season after 60 fires broke out on September 10 in New South Wales, Australia’s most populous state. Australia had a particularly severe fire season last summer amid record heat and drought conditions. 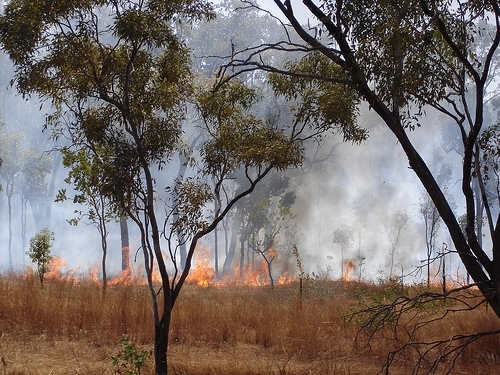 A wildfire in 2007 burns in the Australian outback. 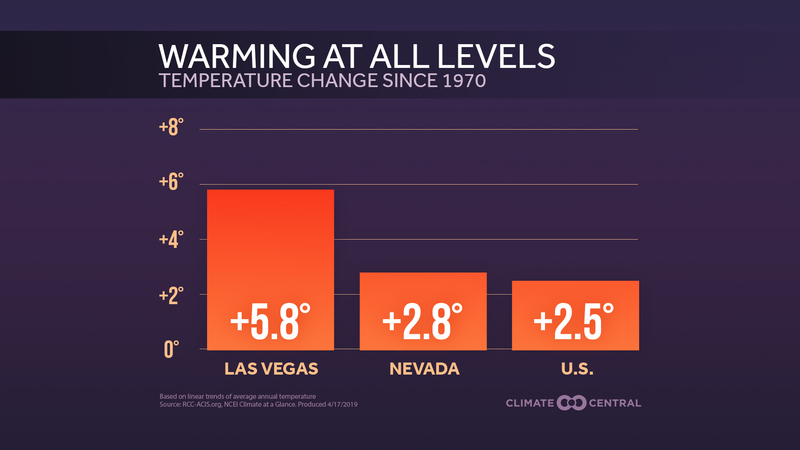 While the hot start to the spring hasn’t been attributed to climate change, the trend is consistent with what one would expect. Will Steffen, a scientist with the Australian Climate Council, told the Sydney Morning Herald that ocean surface temperatures around Australia are up to 5.4°F above normal for this time of year, and that could be one of the drivers behind the high temperatures over land. Such ocean temperatures may be due to a combination of natural climate variability and long-term manmade climate change. What's Causing Australia's Heat Wave?